Many of you are looking forward to spring break and getting outside. Luckily, Kernersville has plenty of activities to keep you busy. Grab a book and head to your local park. While you are there, enjoy a picnic and spend some time on the playground. Spring is also a time to plant new flowers or a tree in honor of Arbor Day. Visit our local farmers market for fresh fruits and veggies, join an athletic league, or get in shape by walking in the parks or joining our programs. There are options for everyone to choose from right here in our home town. Spring is the time of year that gives way to new beginnings. You may recall the inclusion focused renovation of Fourth of July Park last year. The highlight of the project was the “Freedom Playground” and the “Exploring Your Senses” grand opening special event. Both the event and playground enabled children to play and enjoy the park side by side regardless of abilities and without limitations. At that event, our department encountered individuals in our community living with disabilities in need of specialized and adaptive services. We made the decision to expand our program offering targeting these needs. Knowing that the University of North Carolina at Greensboro has a great Therapeutic Recreation Department, we collaborated with them to assist us in our goals. As a result, the establishment of a Masters Associateship with UNCG Masters student, Casey Wermoth, was created. Casey was tasked with developing a survey for Kernersville residents to identify areas of focus and need so that we can provide effective programming. During the month of March, residents received the “Exploring Your Senses” survey in their mailboxes. We had an overwhelming response; we want to thank the community for their engagement and assistance. We have been gathering, inputting, and researching the data given thus far. Based on the preliminary results, we have planned two events to begin promoting adaptive and inclusive activities not only within Kernersville but also within the region. The first event will be on Saturday, April 13 from 11am-3pm in Fourth of July Park entitled “Celebrate Your Senses.” The event is carried over from the “Exploring Your Senses” template established last year. Like last year, there will be informational booths, vendors, activities, as well as food and fun. However, this year we will have a variety of adaptive sports and activities to sample. The “Celebrating Your Senses” special event is not only focused on introducing our expanded offerings, but also providing everyone the opportunity to try something new. We would also like to highlight that “Celebrating Your Senses” is a debut event for our adaptive services; the event is for everyone regardless of their abilities. Following “Celebrating Your Senses,” we will be hosting another event promoting adaptive cycling in partnership with High Point Parks & Recreation, Greensboro Parks and Recreation, and Wake Forest Baptist Health. It will be held at Fourth of July Park on Thursday, May 16, simply entitled “Adaptive Cycling” where youth and adults with physical disabilities will be able to test and ride adaptive cycles. Trained staff and volunteers will provide training on transfers, bike fittings and adjustments, and basic bike maintenance. There will be various adaptive cycles to try along with a short ride from 4-6pm. Be on the lookout for more information and how to register for this event on kvparks.com. Looking for free and fabulous fun in your neighborhood? Summer Movies in the Park is a perfect chance to relax and enjoy a safe hassle-free night under the stars in Harmon Park at dusk. Come early to get a good seat! Activities and movie inspired food and drinks are available to purchase. 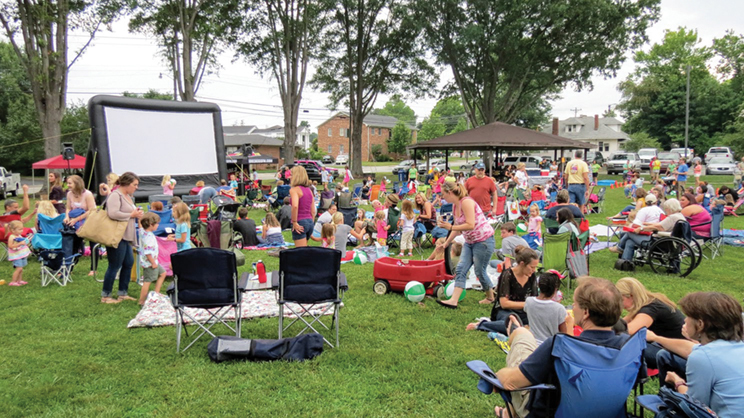 Movies in the Park is a family-oriented event with all movies rated PG. Mark your calendar with the list below because you don’t want to miss out on this fun summer event! In the event of rain, stay up-to-date by following us on www.facebook.com/kvparks. Summer Camp registration is now open and we are ready for 2019, are you? Spend your summer with us in our 8-week camp. Plenty of pool visits, weekly themes, field trips and more! Summer camp is important because it offers a structured opportunity for children to grow. Kids go from home to school to extracurricular, with each environment contributing to their development. Summer camp, then, is another unique venue for growth, allowing kids to become independent and self-confident, while socializing and making new friends, and even learning new skills. It is always amazing to see just how many kids are having a great time with their camp experience. It is the benefit, the stories and the positive impact that stand out each year. Do you have a talent and love teaching a new skill you want to share? Host a program during our spring program session with us! Email Program Supervisor Cady Ray (cray@toknc.com) to find out how. We are now accepting Honeybee vendor applications, visit www.kvhoneybee.com for your form.